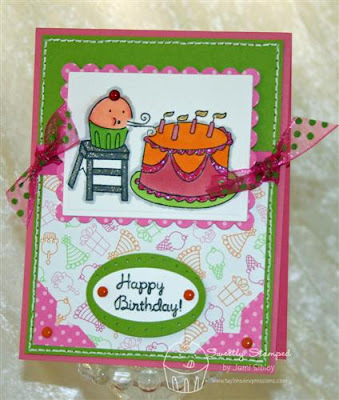 Amidst all the Christmas card making sometimes it's fun to veer off and make a fun birthday card. 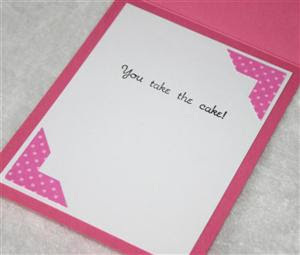 Having all my Birthday Girl Key Ingredients stored together in a document case makes it easy to create a cute card without a lot of thought. I stamped the image from Sweet Celebration onto white cardstock (I have so many different ones I honestly don't always know which I've used) with Tuxedo Black Memento ink and then colored it with Copics to coordinate with the designer papers. It was then cut out with a nestabilities rectangle and layered onto a scalloped rectangle. This card layout is a classic *go to* and I just added the sentiment in the ovals (SU large oval layered over the wide oval) and the photo corners (also an SU punch). All the cardstock, ribbon, brads, and designer papers are from the Key Ingredients pack. I just added a little Dazzling Diamonds glitter to the cake and a clear Rain Dot to the cuppie's cherry. Oh and I colored the ladder with a Sakura sparkly silver gel pen. I hope you are enjoying this holiday season, but if you need a little break from all of it try sitting down and creating a simple non-holiday card. You'll be de-stressed in no time! Click here to hop over to Taylored Expressions (the store) to shop now. Jami this is just adorable! I LOVE it!